Trying something new out here. I really, really love the Desert Hydra. It (and the Supreme Guardian) pulled me into Skorne almost against my will by sheer prettiness, and while it’s been amazing in the Xerxis 2 Kaiju list, I really wanted to try it with some other casters that might pair better with Rasheth. This list comes courtesy of Peyton from Disciples of Agony. Enter Makeda 3, who can make this guy RAT 8 POW 16 on five sprays or MAT 8 PS 22 with 9 attacks and brings a side-stepping monster (Molik Karn) to clear off jamming models before the big guy goes in. Couple of other interesting points - Bulwark makes him DEF 12, which is a super relevant stat for a Gargantuan, and the Krea’s Force Aura stacked on top of that makes him DEF 14 ARM 21 against shooting which is real respectable with 50 odd boxes tacked on top. I was playing, once again, into JP’s trolls with a pretty standard Kolgrima list. Note: it has been pointed out to me that you can add a Reptile Hound to the list for literally free by making Zaadesh into a free card. This is actually super relevant because it makes Tag Team a real spell on Zaadesh’s card. Unfortunately, it was not point out until after this game and the next one but it is the direction the list will go. I won the roll and chose first, getting saddled with the side that had a super awkward building for me to work around. I whip the Animantarax thrice and heal for three. Everything runs up, with Makeda putting Bulwark and Sandstorm up before charging. The Battle Bears keep the Animantarax back on the left, while Karn and the Hydra both received Rush from the Gladiator and Zaadesh to get up farther. This building and the Beast Handlers will prove to be a major problem in later turns, I’m still having problems with deploying and utilizing them on turn one. In this case, I was pretty sure they’d never be making it back over to the Animantarax and so decided giving up efficiency turn 2 was better than never having a loaded up engine. There isn’t anything he can charge, so JP sets up to punch in next turn. He jams me with Raiders, sets up his Champs in the back, and puts clouds down to shelter his Bears, as well as popping everything left into the Krielstone. I actually strongly consider going for assassination this turn, but Karn is too far away from the Beast Handlers to get a free charge off. Makeda FEATS and puts up Deathbringers before charging up the table. Karn gets Rush and the Hydra sprays down the blocking Raider and the one behind the obstacle that would get a free strike. Karn charges the Earthborn, Side Steps into the Krielstone, and then Side Steps into Kolgrima on nothing with 3 attacks. Hmm…actually looking at oddsmachine, three attacks is still 92%, four gets it to 98%. If I put two Turtle shots in first under Incite it goes up to 98%. Definitely should have gone for this one. Oh well, we get a longer game because of it. What I do instead is start abusing terrain like crazy. Makeda moves in and kills two Raiders and backs up with Fate Walker. The Hydra moves up then and kills a bunch more Raiders, but is positioned in such a way that he can’t be gotten to by more than 2 Champs thanks to the Obstacle and the newfound presence of Molik Karn who walks up, kills a couple Raiders, and Fate Walkers back. My Animantarax finds the sliver of zone it can contest without getting charged and stays there. Beast Handlers charge up, Agonizer screams -2 Strength, and that is my turn. A Raider bomb kills my Shield Guarding Court Member with some nice dice, Champs shuffle up, and Kolgrima moves up, pops her feat, and then Vanishes back out of Molike Karn’s easy charge range. The Bears move up staggered, and then the Raged Earthborn charges Molik Karn. He boosts to hit and CRANKS the damage roll. Misses the second, hits the hard 9 on the third and CRANKS that one as well. We realized about 20 seconds after this screenshot that he was in Agonizer aura, so Karn took 4 less damage, but the Earthborn left him on seven with two attacks. Oof. Trolls score a point for the right zone. The objective heals Karn, nothing frenzies somehow, and I get to work. Makeda FEATS and charges the Earthborn, but fails to kill him by a smidge. The Hydra has to move over and finish him off so that Karn can get unstuck. Karn goes in on the Bears, killing two and Fate Walking back to safety. Makeda is on two transfers by this point thanks to her feat. I opt to keep my Hydra alive by putting the Titan between him and the Champs, also contesting the right hand zone. 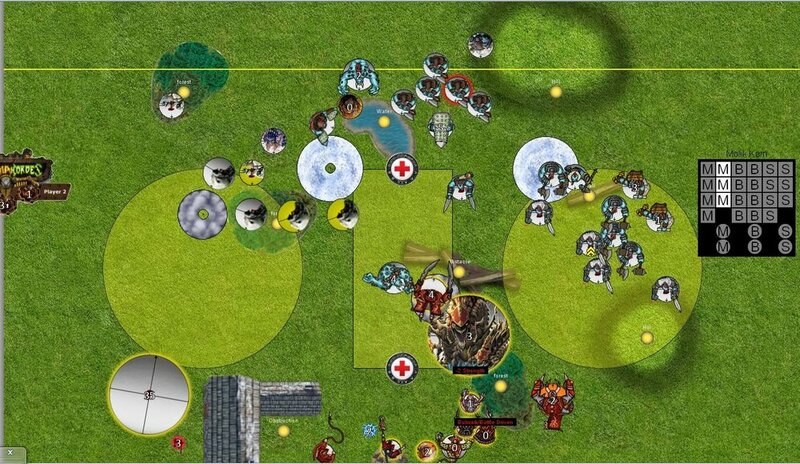 The Animantarax charges in and kills the last Bear that Karn didn’t get to and backs out of Mauler threat range. No pic for this turn sadly. All the things that can charge the Animantarax, but fail to do a ton of appreciable work with the Bear rolling low on his charge. Champs come in under the Stone Aura and obliterate the Titan with three attacks. Ouch. Kolgrima drops 2 clouds, one on the Hydra and the other on the Turtle, and JP scores a second point. Makeda puts up Deathbringers and backs up. My Agonizer screams and runs into the right zone, and then Karn clears off Valka and the Bear Handler on his side before Fate Walking back. Beast Handlers clear three fury off him and give the Hydra a free charge. Instead of engaging with the Champs, I opt to bully Kolgrima here by sending the Hydra up, killing the Fell Caller Hero, and then spraying down the Objective and a bunch of Krielstone guys. 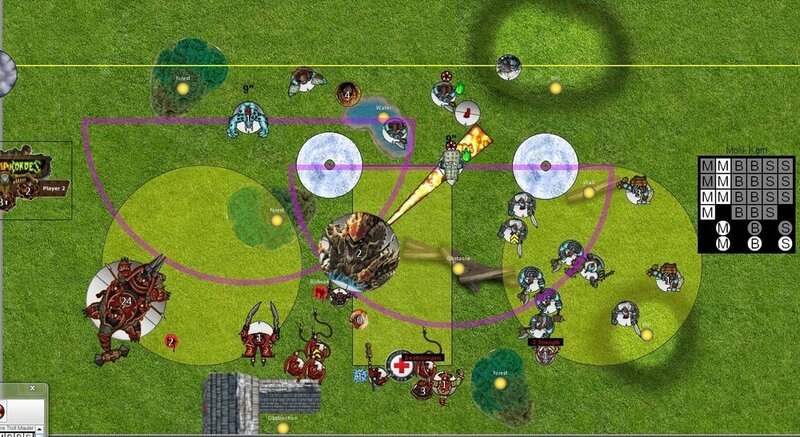 The Animantarax boosts hits into the Bear unit on his left, killing both, and puts shots into the Mauler before backing up outside of non Hunters’ Mark charge range. We realize that even with Hunters’ Mark, the Mauler cannot get to the Hydra because of the Snow Bank, and I pass the turn. The Champs super murder my Agonizer, and Raiders jam the Hydra pretty good. The Runebearer applies Hunters’ Mark on the Animantarax which allows the Mauler to super murder him. Well, it’s been what I was hoping for all game, a way to kill a million billion Trolls with sprays, so even though I have another insanely high probability assassination run on the table here, I opt to keep playing for attrition. Makeda drops Bulwark and casts Incite. Karn kills the Mauler with Enrage and Incite and then Fate Walkers back behind the forest. The Hydra charges into the Champs and then kills all but one with sprays, leaving him corroded, on one, and the two Sorcerers on one each as well for good measure. Orin moves up in case JP forgets to move a fire beacon troll and I pass the turn after running my Krea to contest so I don’t instantly lose. The corrosion does not go out, the Champ fails his tough check, and the Krea suddenly seems much more likely to survive. The two Sorcerers put their spells into it and then charge, but the beast survives the charges intact. The Krielstone pops for +2 to cold damage and the stone runs to be a beacon for Kolgrima. Kolgrima gets Harmonious so that she can Vanish for free. She gets the crit freeze on the first spray, but she only has three sprays and I have two transfers, so I eat two sprays, transfer once in case I’ve forgotten about something else, and Makeda lives. Karn gets Enraged, Makeda casts Deathbringers, and Karn calmly walks into Kolgrima and kills her in one attack. Incite and Hydra sprays are really strong together. RAT 8 POW 16 is nothing to sneeze at by any stretch. I felt like I abused the terrain really well in this game, that obstruction practically made my Hydra immune to the Champs for most of the game until it was far too late. A Reptile Hound added to the list would have meant I could potentially have kept my Gladiator for another turn, and I think that would just have been devastating. I’m excited to keep testing this list out over the next couple of weeks. I’d like to try it into Iona, Harbinger, and High Reclaimer, as well as Issyria before deciding if it’s staying in the pair.